For the hyper-connected and tech-savvy Millennial segment, banking is more synonymous with mobile banking, P2P payments and digital currencies than it is with the traditional bank branch. With unique needs and different communication channels used, this huge market opportunity is also the most difficult to satisfy. The majority of Millennials say they don’t think their bank offers anything different than a competing bank. In fact, 71% said they would rather visit the dentist than visit a bank. They are also willing to consider alternative providers such as Google, Amazon, Apple, PayPal or Square. Bottom line, Millennials represent the greatest challenge – and growth potential – for banking today. 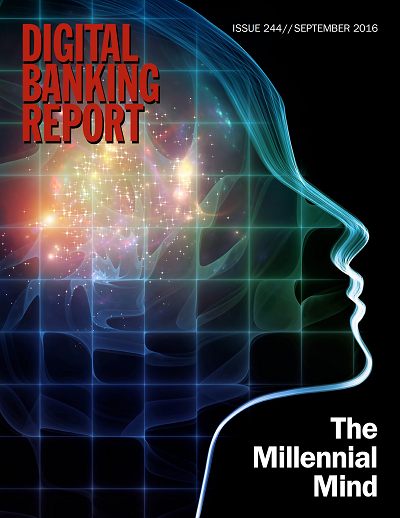 The 62-page Digital Banking Report, ‘The Millennial Mind,’ provides insights into the behaviors of today’s Millennial, the increasing importance of alternative banking services such as P2P payments and lending, the banking and communication channels used and the risk presented by fintech start-ups. Analysis of how the largest generation in history will impact financial services products, services, channels and interactions in the future.